Recently I have been making more masculine cards than female cards so today I thought I would show you the ones I have made. The first one was for my brother in law. I decided to use the cuttlebug seeing spots embossing folder on the kraft card and use some circles and stars of patterned paper. 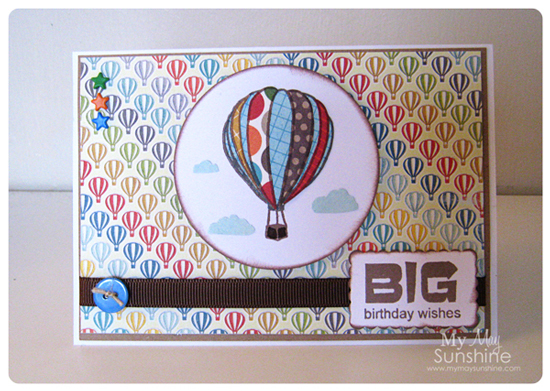 Papers – My Minds Eye out of the blue and fly a kite | Stamp – Amy R It’s your birthday | Twine – Donna Flower | Star – Fiskars punch | circles – Nestabilities Spellbinders classic circles | Button – Papermania | Cuttlebug Seeing spots embossing folder . The next card was for my step-dad. I thought I would use 3 stars going down the card and then use the smallest Nestabilities Spellbinders label one die to put the sentiments on to and balance the stars. Papers – Making Memories Just Chillin’ | Stamp – Amy R It’s your birthday | Brads – Making Memories | Buttons and Ribbon – Hobbycraft | Button twine – The Ribbon Girl. 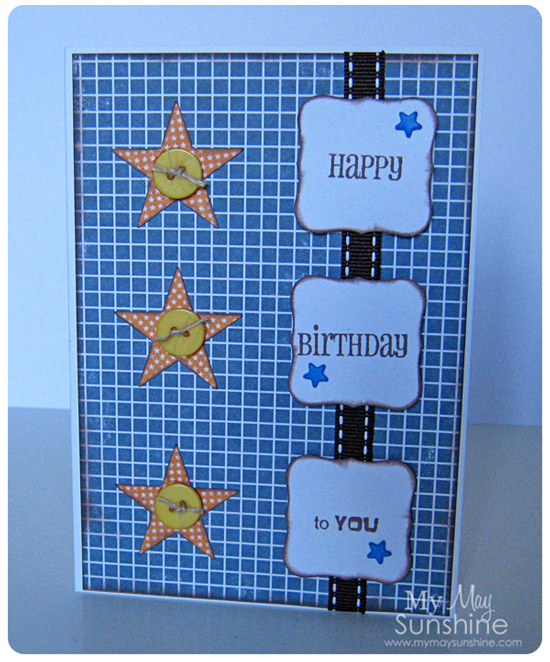 I made the next card for my sister in law and again used circles and stars. 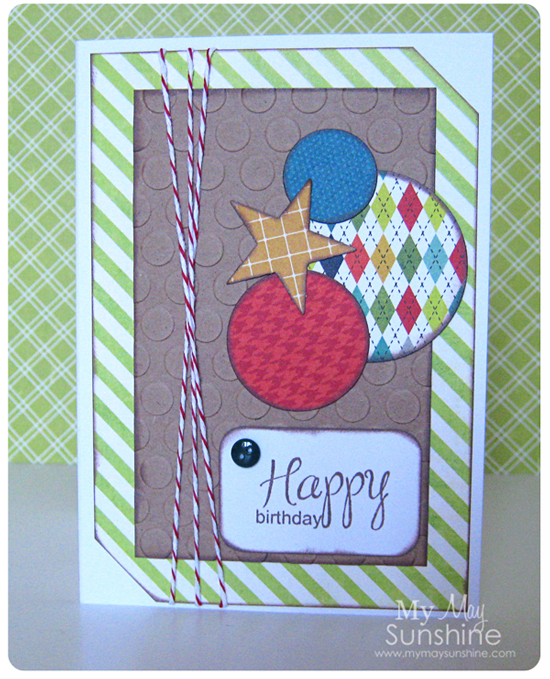 This time I used the Tri-boss chequered embossing folder and added the name. Papers – My Minds Eye out of the blue and fly a kite | Stamps – My Pink Stamper Fabulous Phrases and Stampendous Tiny Alphabet | Twine – Donna Flower | Stars and circles punches | Tri-boss Chequered embossing folder | Tag – Staples. The last card was for our nephew. I decided to use the Skipping Stones Design Uplifting stamps and use the balloon and the My Minds Eye Out of the blue papers which have some lovely papers with balloons on for the background. 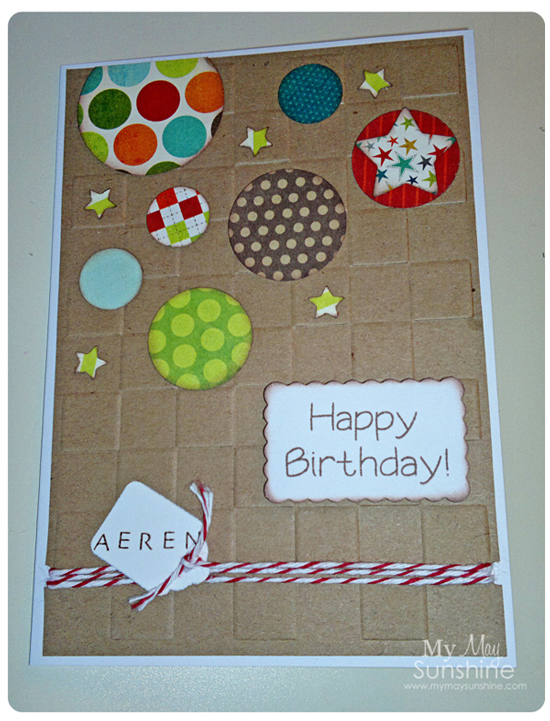 Papers – My Minds Eye out of the blue and fly a kite | Stamps – Amy R It’s Your Birthday and Skipping Stones Design Uplifting | Spellbinders Nestabilities classic circle die | Brads – Making Memories | button – Hobbycraft | Button twine – The Ribbon Girl | Ribbon – American Crafts. Most of the cards don’t have too much embellishments or detail as, I might be wrong but, men don’t really mind whether a card is detailed or not. What do you think? When you make or buy cards for men, does it matter whether they are embellished or detailed or is it when they get to a particular age, do they appreciate them more? Let me know your thoughts. A present for my sister in law.